HomeBlogBeginner’s Guide To SMS Marketing For Small Business! 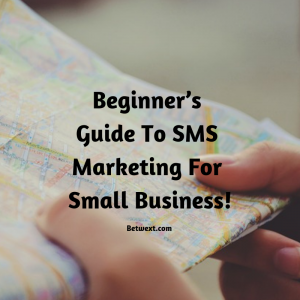 Beginner’s Guide To SMS Marketing For Small Business! Are you looking at SMS marketing for a small business you own or manage? Well, you’re in the right spot. SMS marketing (also known as mobile marketing or text message marketing) is taking the small business world by storm. NEVER in the history of small business has a marketing technique held such promise. SMS marketing is easy to use, fast to set up, inexpensive to deploy, and gets unheard of results! If you own or manage a small business, now’s the time to learn everything you can about the power of SMS Marketing! An SMS message is simply a text message. If you’ve got a cell phone, you’ve no doubt sent or received a text message. SMS Marketing is simply the ability to send marketing messages and communications to the cell phones of customers, prospects, employees, or anyone you want! Some call it text message marketing, or text blasts, others call it mobile marketing or SMS Text. SMS Marketing allows you to send hyper-focused messages to your VIPs, customers, or business prospects. You can make them a special offer, send a gift, a coupon, or even a video! You can drive huge engagement… and really connect with your customers. Some businesses are using SMS messages to educate prospects, as a way to do product support, and even to INSPIRE their users. I’ve seen some business owners use SMS messages to text suppliers, staff, and employees too. But that’s not all… Text marketing isn’t just for businesses! Nonprofits are using SMS marketing to augment their fundraising… they use SMS messages to coordinate volunteers… and some use it for information distribution. Conferences are using SMS Marketing to announce sponsors, post room changes, and update schedules. The use of SMS marketing is endless… and the more it’s used… the more popular it becomes. SMS Marketing is endless… But, is it right for your business? Who Should Use SMS Messaging… and WHY? The short answer is EVERY small business and organization should be using mobile marketing… and specifically SMS messaging. According to Comscore more than 198.5 million Americans use a smartphone. That means more than 79.1% of the entire US population owns a smartphone. I don’t know about you, but my smartphone has become invaluable. I use it every few minutes and it never leaves my side! Smartphones are more than just phones. They are microphones, cameras, video recorders, and research tools. They have replaced computers and typewriters, and even the pen a paper. But that’s not all. Smartphones are maps, and are quickly becoming wallets and credit cards. Smartphones are entertainment devices, games, and even TVs. There are millions of uses for smartphones… and best of all… we’ve barely scratched the surface. Who knows what amazing features these devices will have in just the next 10 years. 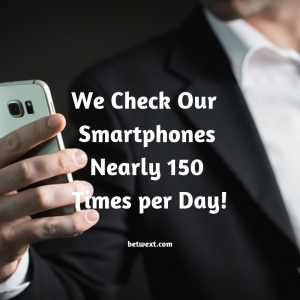 According to a study by Kleiner Perkins Caufield and Byers the average user checks their smartphone nearly 150 times per day. Think about that… if we’re awake 16 hours a day, and we look at our phone 150 times… It means we pick up and use a smartphone every 6.4 minutes. We use our smartphones more than any other piece of technology. And smart business people are starting to take notice. Everywhere I turn, I see a new business using text message technology. Why is SMS text message marketing powerful… and why are so many small businesses using it? 3. SMS marketing is incredibly effective! Let’s dig in a bit. If you have the right SMS marketing service, sending messages is very inexpensive. How cheap can it get? How about a few pennies a message! It’s not free, but nothing is. According to the USPS, a first class stamp will cost you $0.55… and a post card, $0.35. And that’s just postage. Don’t forget to add in the cost of paper and envelopes… and the additional cost to print everything. On top of all of that cost… most mail gets tossed in the trash without even being read! Well, email’s not free either. A business level account at a respected Email Service Provider starts at about $15 a month. And they limit your sends, can’t guarantee your message will get by the spam blockers. Oh, and if you do send a message… there’s no guarantee it gets read! Average email open rates are only 15% to 20% for strong, well cared for, active lists. I’ve found plans where each SMS message costs just $0.02 to $0.04 cents to send. By the way, some texting companies (like Betwext.com) have special deals for non-profit organizations, and those costs start at a penny a text. Think of it… a quick and easy way to reach your perfect customers for only a penny! Cost is often a factor when small businesses look at marketing… but it’s not the only one. You’ve also got to look at usability. Take for example online marketing. Almost every small business owner I know wants to do online marketing… but many don’t. The time and complexity of running a successful marketing campaign. Online marketing can be very successful, but it’s incredibly complex. Bidding, set-up, tracking, codes, web pages… there are thousands of things you need to do to do it right… and if you mess up on one – well you won’t have much success. SMS Marketing is so much easier. Here’s the key – an SMS message is limited to 160 characters… just slightly longer than the old tweet on twitter. As a result, you can’t spend hours and hours agonizing over what to say. You simply put together a short message, add in a call to action… and send the message. Often you can set this up and get it sent in just a few minutes. As a matter of fact, many business owners I know do their mobile marketing in less than 30 minutes a month! Yes – it’s easy to do and quick too! 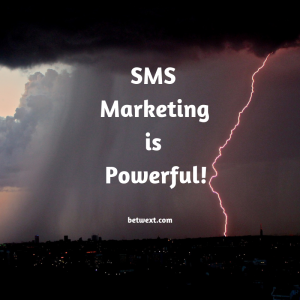 YES, SMS Marketing is incredibly effective… how effective? Consider this, some marketing studies report that OVER 90% of SMS messages are read… most within a few moments of being delivered. Let me say that again – OVER 90% of SMS Messages are read. Remember when we talked about email… only 15% to 20% of email messages ever get opened. 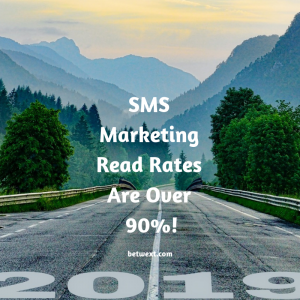 With SMS Messaging – the read rate is over 90%. Does that sound effective to you? It does to me… that’s why I said SMS Marketing is incredibly effective. And that’s why every small business and organization needs to start using SMS marketing today! While you can hastily throw together a quick text message and send it from your mobile phone… real marketing takes a bit of effort. Not much… but if you learn a few things about how best to market using SMS messages, you’ll be much happier, and find instant success! I’ll share some of those tips and techniques later on in this blog! We’re going to address a number of topics over time… and each will highlight a different part of SMS marketing explain how small businesses use them best! If you’re starting a business, the key to success is overcoming your fear and getting started. The best way to overcome fear is to develop a plan to target your ideal customer and communicate with them in the best way possible. Text marketing is a very powerful tool that small businesses use for success. Try SMS marketing today with Betwext.com. 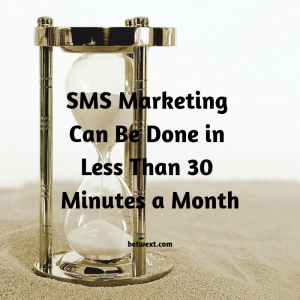 Ready to Start SMS Marketing For Your Business? Use this link to sign up for the Betwext Plan. That’s not all, you’ll also get the cheapest messaging rates in the industry! Learn more about the Betwext Plan today you can see the details here. Remember, sending SMS messages is a very powerful way to connect with prospects and customers. 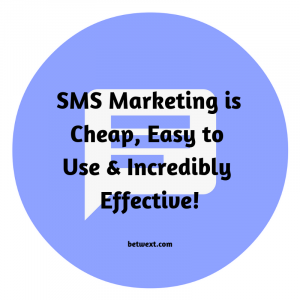 Best of all, SMS marketing is cheap to use, easy to send, and incredibly effective! Get your own Betwext account here… and start growing your business!